VS Vision Systems GmbH releases RISC based industrial PC, OnRISC Alekto 2. November 22, 2013 - VS Vision Systems GmbH - Industrial PC provider - announces the release of a RISC embedded industrial computer, the OnRISC Alekto 2. This model is a new member of the OnRISC family. The system is based on a modern Sitara ARM Cortex-A8 RISC processor from Texas Instruments. Among other functions it provides a connector for display and audio function, two independent network ports for Fast Ethernet, two ports for USB 2.0 devices, two serial ports and a connector for CAN bus. Further there is a USB/OTG port for system developers, a slot for a SIM card plus a slot for CFast mass storage cards. Possible internal extensions are for a GSM/3G/4G card, and WLAN function. For industrial purposes a connector of 8×Digital-I/O signals plus I²C completes the list of basic features. Alekto 2 supports Windows Embedded operating system, the version Windows EC 7 is evaluated and available. VS Vision Systems GmbH will offer prepared microSD cards to install and boot from. As with all the other OnRISC models Debian GNU/Linux is available as operating system. Vision Systems provides a sample installation of this operating system, an image file prepared for a microSD card. Debian for Alekto 2 is planned to come with Kernel 3.2 initially. System Developers may also use buildroot as their Linux distribution, a sample configuration is provided. The manual covers instructions to generate a system using buildroot. To use Alekto 2 as a Router the OpenWrt software will also be available. This is currently in development and evaluation. Adapting Android for Alekto 2 is under consideration right now. To connect a monitor the Alekto 2 uses a space-saving connector. Audio information is embedded in the display data stream, so speakers in the monitor are used. Stereo sound with 48kHz is supported. The signals follow single link DVI definition, standard adapters allow to connect an existing DVI monitor to the display connector. For display control Alekto 2 uses a PowerVR SGX530 3D engine, which provides a resolution up to 720p. This supports the software interfaces of OpenGL-ES 1.1+2.0, Direct3D Mobile, OpenVG 1.0 and OpenMax. This display is supported in Linux/Android and Windows EC 7. 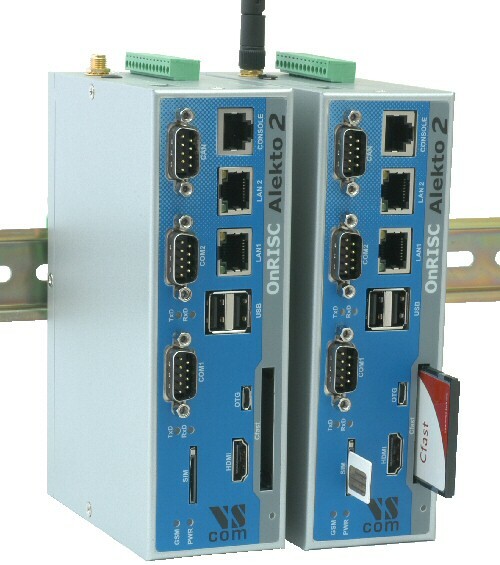 The three-way serial ports of Alekto 2 can connect to RS485 field busses in industrial installations, even if operating on higher bitrates. The CAN bus also provides field bus connectivity, up to 1 Mbit/s. To operate and test the port Linux may use the VSCAN API or the SocketCAN functions. Field busses on Ethernet are a third class of possible connects. The digital-I/O function on the top side provides eight signals on TTL (5V) level, they can operate as output or input. In input mode they generate an interrupt on change of signal level. In output mode they can source up to 32mA, or sink as much as 64mA. These high current signals are sufficient to directly drive LED, or control some low current relay. The current for the relay is provided by the 5V auxiliary power output on the digital-I/O connector. The I²C signals control small displays or other useful hardware. The Alekto 2 already provides two network interfaces for Fast Ethernet. GSM mobile communication and WLAN are realized by expansion slots or externally connected via USB. Some customers want to use systems like Alekto 2 as an industrial router. To support such applications VS Vision Systems GmbH adapts the current version 12.09 "Attitude Adjustment" of OpenWrt to support Alekto 2. As a result customers have a headstart to configure their own router application. OpenWrt in Alekto 2 will support the special functions of Alekto 2. The serial ports are accessed via RFC2217, and also the Digital-I/O functions will be available. Further the function of CAN is available via network, the control is realized via the VSCAN API known from the VSCAN products. This is similar to install an extra NET-CAN adapter.